Also take a look at the Reporting features we shipped as part of Octopus 3.1 which provides reporting optimized views of the live deployment data, no longer requiring an XML export. Ever wonder how many deployments you did this month? 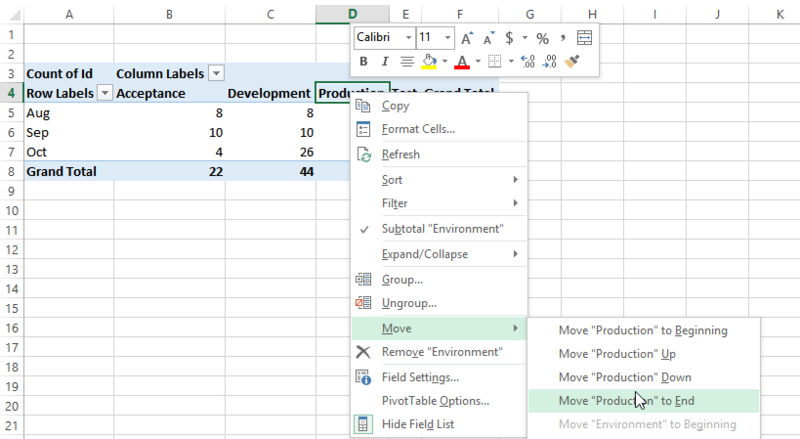 In this page, we'll help you to answer this question by walking you through how to export your deployments to Excel, and then to view them in a pivot table. Export all deployments to an XML file. 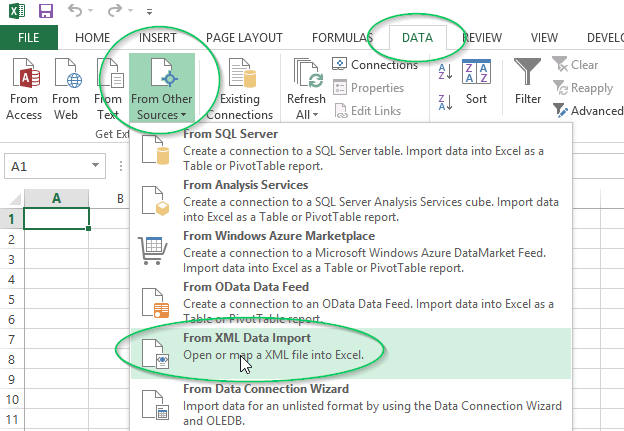 Import the XML file in Excel. 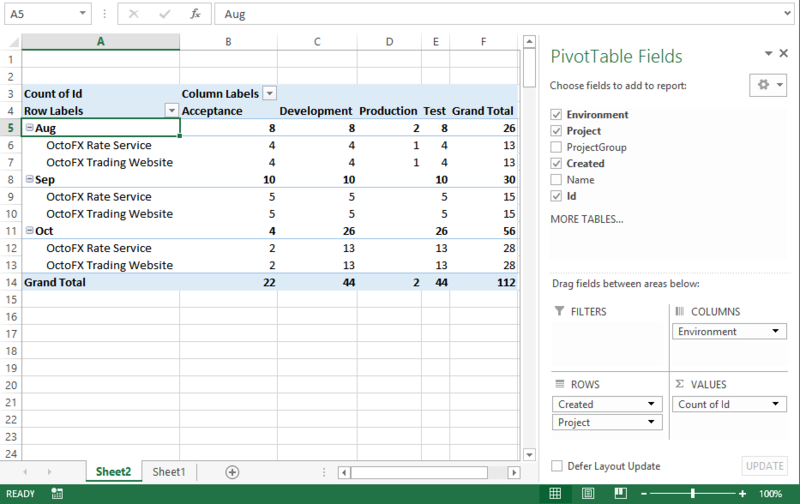 Report on the data using a pivot table. Before we can report on the data using Excel, we need to export it in a format that Excel can import. The easiest way to do this is using an XML file. This file is now ready to be imported into Excel. 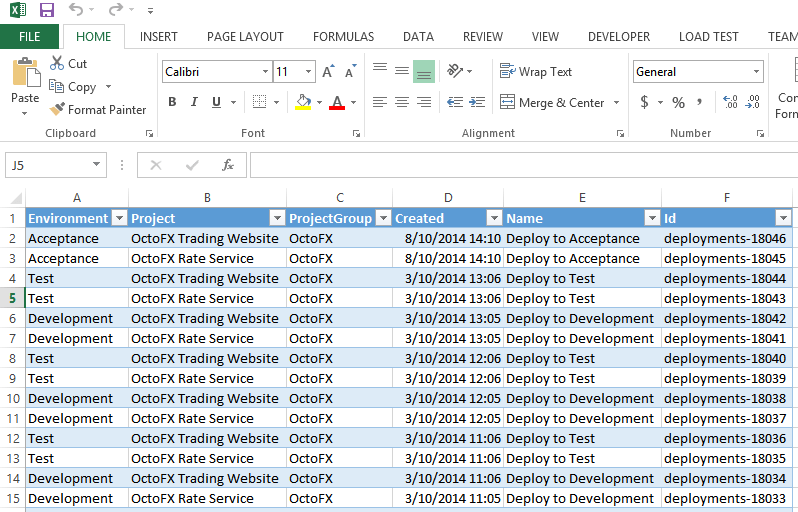 Now that we have an XML file containing our deployments, we can import it into Microsoft Excel. 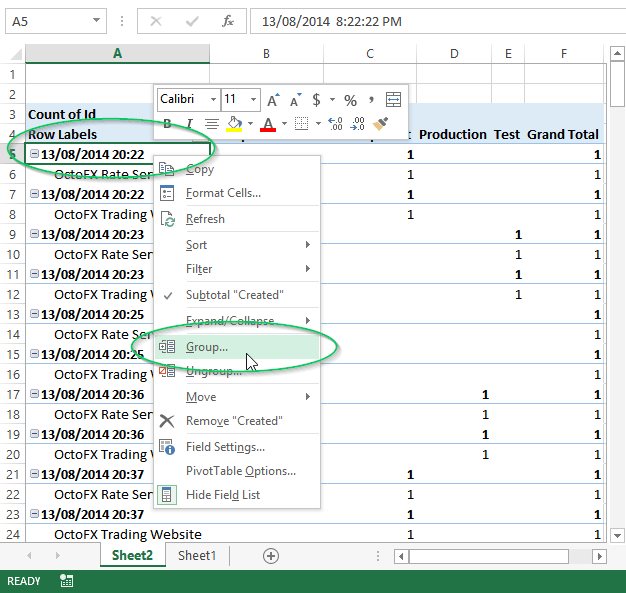 In this example we are using Excel 2013. Open Microsoft Excel, and create a new, blank workbook. On the Data ribbon tab, click From Other Sources, then choose From XML Data Import. Excel will prompt you that the XML file does not refer to a schema, and that one will be created. 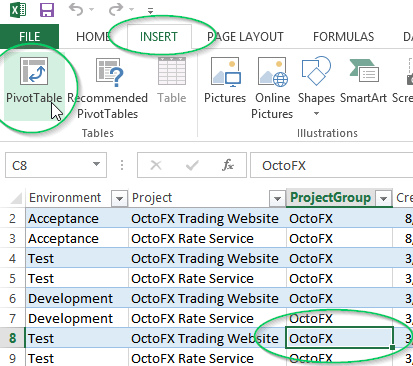 Click OK.
Excel will ask you where to create a table. Choose the location in your workbook to put the new table, or just click OK.
You should now have a table that lists each of the deployments you have performed with Octopus, along with the name of the environment, project and the date of the deployment. 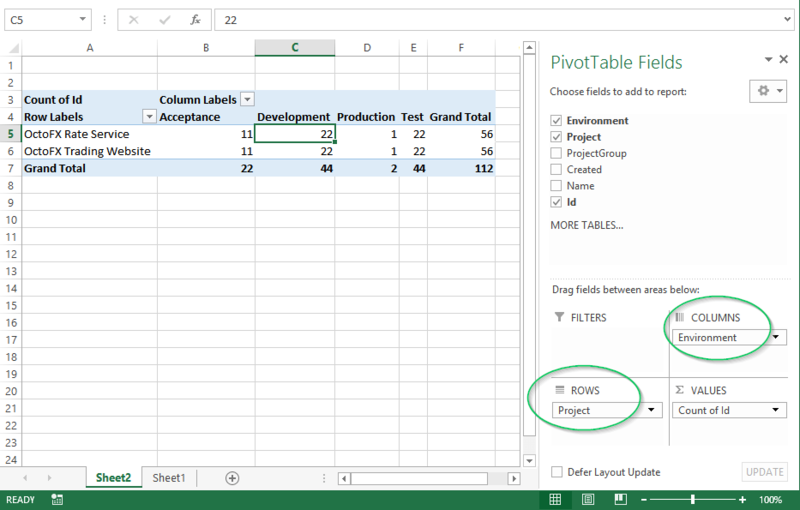 It's easy to turn the table of deployments into a pivot table for reporting. 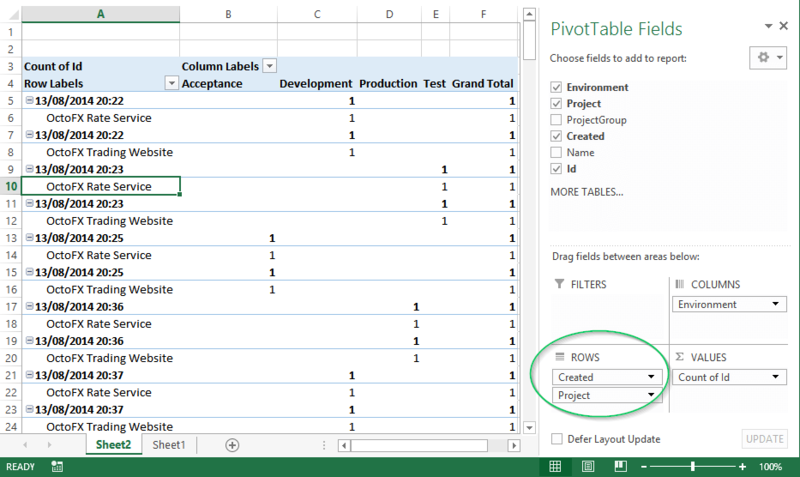 Select any cell in the table, then from the Insert ribbon tab, click PivotTable. Excel will prompt you to ask where to place the new pivot table. Click OK to add it to a new worksheet in your workbook. 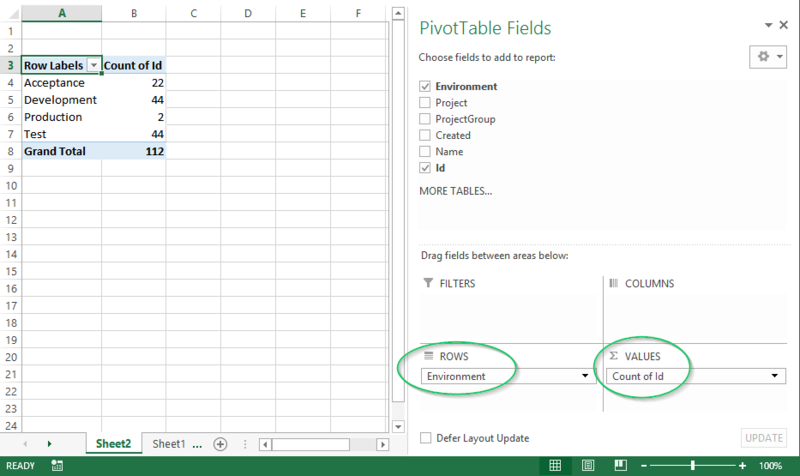 You can now build the pivot table by dragging fields into the Rows or Columns of the pivot table. For example, here's a breakdown of deployments by environment. Note that the Id field was dragged to the Values area, and Environment was dragged to Rows. You can also group the results by month or other measures of time. First, drag the Created field as as row. Now, right click any of the date values, and click Group. 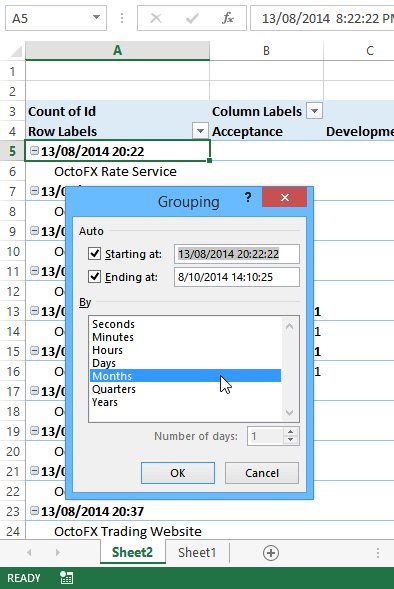 Choose the level of granularity that you want to group by, then click OK. In this example we chose Months. Finally, don't forget to add pretty graphs! As you have seen, only a small amount of data is available for use for reporting. If you use retention policies, releases and deployments that have been deleted by the retention policy will also not be available for reporting.